Describe your Gallery space: We have two galleries. One very large upstairs gallery usually holds our member shows. 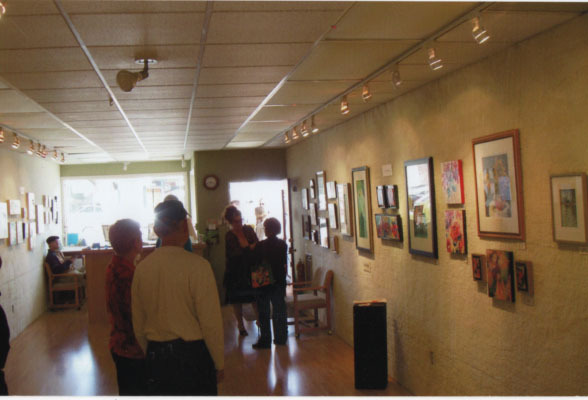 A smaller, downstairs street level gallery usually exhibits work by our featured artists. We also have a roomy activity room that we use for meetings, classes, receptions and other art related events. How long has the gallery been open: Our association was founded 59 years ago and bought our current building thirty-nine years ago! What was the impetus to start the Gallery: Our association’s mission is to exhibit and sell work by local artists and provide art education to the community. For most of their first twenty years, our association was without a permanent home. They exhibited in homes, businesses, and public places. Thirty-nine years ago they raised funds to buy a small building on Main Street in Morro Bay. California to establish a permanent place to exhibit and hold meetings. The building was later expanded to include our large upper gallery and downstairs activity room. Tell us more about the Studio: Our activity room serves as a meeting room, classroom, and sometimes as a studio. Every Wednesday, all who are interested may gather for an open studio – Creativity Days. On other days we have ongoing classes for oils and acrylics and watercolors. Do you have exhibits: Yes, we usually have nine shows per year. And each show is actually two shows. Usually our members exhibit in the upper gallery and our featured artists show in the lower gallery. What type of work do you showcase: We exhibit original art in almost all media, including oils, acrylic, watercolor, mixed media, encaustic, pastels, photography, fused glass, jewelry, and ceramics. Do you work with local artists or artists from all over: Almost all our artists are local. In fact, in our area we are the largest and nicest venue exhibiting local art. Occasionally we host regional shows and have hosted national ones. Do you add new artists regularly and if so what is the process in which you select them: Artists who pay our annual membership fee and are willing to volunteer for docent hours are eligible to exhibit in our galleries. We gain new members year round. What is your personal favorite exhibition from the gallery, past or present, and why: Each year, my favorite show is our fall Student Scholarship Show. I am just so proud that our small organization raises funds to host the show and to offer thousands of dollars in prizes. Last year we awarded over $11,000. I am always excited by the skill level and creativity of our local high school and college students. How many shows do you have each year: We usually have nine shows on site. We also sponsor public events. Art in the Park is held every year on Memorial Day weekend, July the 4th weekend, and Labor Day weekend. What is a typical event like at the Studio: I am not sure I can name a typical event – our activities are varied. Artist Jason Mayr teaches oil and acrylic painters each Monday. Creativity Days (open studio) meets on Wednesday, Watercolorist Kathy Miller teaches on Thursdays. Each month our members meet for a demo by a guest artist. Our meetings are open to the public and we are always pleased when visitors drop in to watch our demos. We also host other classes and workshops as well as receptions for each show opening. Just for fun who is your favorite artist, living or dead, and what about their work moves you: Picasso – because he definitely thought outside the box. What new things do you have in store for this year: We have just finished an exterior face lift of our building – it’s purple! We chose the new color and graphic design to increase visibility. Now we will be working to increase visibility in other ways: a new website, maintaining social network pages, distributing new brochures. We also plan to expand our children’s programs and workshop schedule. Do you have any up coming exhibit that you would like to tell us about: Eclecticity opens May 26 and will run through June 20. The upper gallery will display member work. 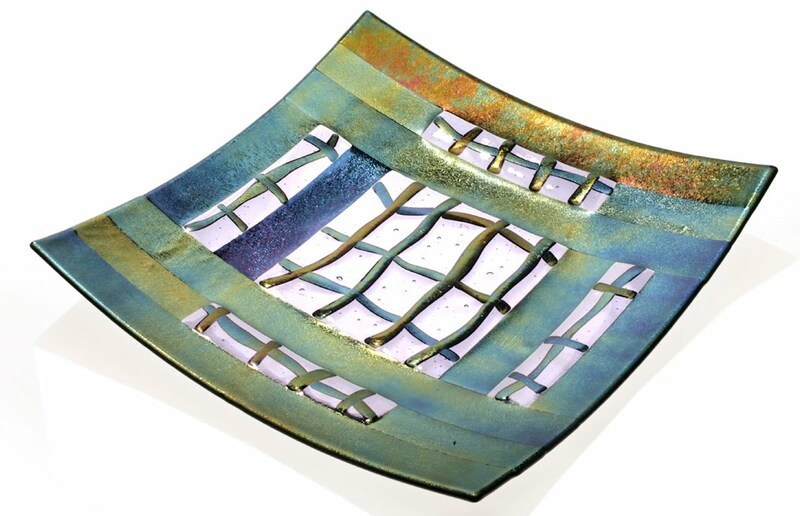 The downstairs gallery will show work of five of our members; their work will include fused glass, pastels, ceramics, and watercolors. Gallery hours are from noon to four daily. Also, Art in the Park will be held Memorial Day weekend, May 29,30,31 at Morro Bay City Park in Morro Bay, CA, and will featured regional artists of all stripes. About a hundred booth spaces will offer work for sale; our proceeds from the show benefit the association and fund our student scholarship shows. Currently our web address is www.morrobayartassociation.org. Within the next few weeks, our new website will be up and running: www.artcentermorrobay.com.